Seward shot 54 percent and lost by double digits Friday night. 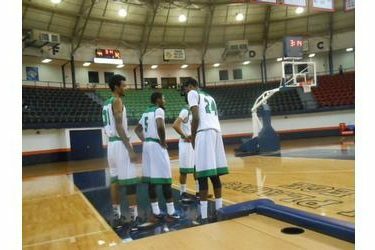 South Plains put up 22 more shots and out rebounded the a Saints by 15 as the third ranked South Plains Texans took down Seward 82-68 in Seward’s first ever game in the Texan Dome. The Texans shot 51 percent. SPC led 44-32 at halftime. SPC’s Andre Spight, who signed at Arizona State, scored 34 on 13-21 shooting. Kevin Sims led the Saints with 17. Jamal Poplar added 13 while Tykwan Garner added 11 and Secean Johnson dropped in 10. The Saints committed 17 turnovers. Seward is 2-5 and plays New Mexico Military Saturday at noon on B107.5 and kscbnews.net. The Texans are 5-2.